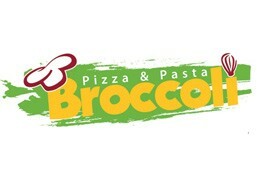 Broccoli Pizza And Pasta is currently closed for delivery and it will open at . Any small pizza and any pasta plate with two drinks. Pasta Plate and one drink. Any large pizza and any two pasta plates with four drinks. Any small pizza and one drink. Chicken , green pepper, cheese. Italian sausage, mushroom, black olives, pepperoni, cheese. Beef, onion, green pepper, tomato, jalapeño, cheese. Mushroom, onion, green pepper, tomato, black olive, cheese. Italian sausage, beef, turkey ham, pepperoni, cheese. Pepperoni, mushroom, green pepper, black olives, cheese. Shrimps, green pepper, cheese, black olives. Chicken, chicken sausage, mushroom, onions, green pepper, black olives, cheese. With your choice of sauce and pasta, Served with garlic bread. Pesto sauce, pine nuts, diced potatoes, diced green beans, extra virgin olive oil. Pesto sauce, pine nuts, diced potatoes, diced green beans, extra virgin olive oil, Served with Salad & drink. served with salad & drink. 4 eggs, vegetable sauté or salad, bread, jams & illy coffee.